Academy Spring 2019 Training begins the week of January 14th. All practices will be held at Adler Field until we return to Boerne City Park On March 1st. Spring 2019 SA PDF game schedule will be determined after the Director's scheduling meeting on January 15th. Teams will train 2 days a week (Monday/Wednesday or Tuesday/Thursday). To attend further sessions, please contact Academy Director, Jarred Harriott. There are always opportunities for players to register for Academy at any time throughout the season! 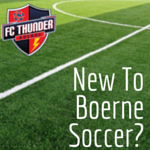 If you are new to the area, looking for a new club, or wish a more competitive environment than the recreational program, please contact our Academy Director, Jarred Harriott at: jharriott@boernesoccer.org to attend a training session!